We left Kuah this morning with almost no wind. This allowed us to do some maneuvering to set the wind indicator which did not give us true readings all of last year. In order to do this, we needed to turn circles in absolutely calm waters so that the wind indicator on the top of the mast would automatically adjust itself to the correct setting. We were doing this today because while we were home in the US Mark bought a new remote control for the Auto Pilot and it suggested this maneuver. Now, hopefully, we will know the true wind direction. We sailed west through the slot taking us to the west side of Langkawi, and then northeast to Koh Tarutao. We motored sailed with mainsail up, and then we sailed with main and headsail. Then we motored some more and sailed once again with main, headsail, and staysail. Then we put up the spinnaker. Once the spinnaker came down, we decided to motor sail with just the mainsail up to our destination. The good thing about the fluky winds is that we got to try all the different sail configurations on Windbird in one day. Everything was working great. The bad thing is that it was not an easy run. We had to keep changing sails. But we reached our destination in the late afternoon, had Robert and Tina of Shirena over for Happy Hour, and are now ready to travel on tomorrow. We explored this anchorage last year with our friends Kevin and Claire so we had no driving force to go ashore. Tomorrow we are headed to Ko Kradan. 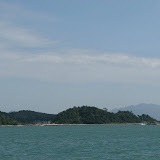 This is an island we have not visited before, but tomorrow is Tina’s birthday (as well as our son-in-law Jed’s) and she wants to have dinner at a restaurant there. Sounds like a great idea to us. We can celebrate two birthdays in one. So off we will go early in the morning. We have finally checked out of Malaysia and will be leaving in the morning for Thailand. Shirena left this morning and we hope to catch up with them at Ko Taratao by tomorrow evening. This was a day to get all of the last things we had on our MUST DO list done. Mark changed the engine oil, I worked all day finishing one last Christmas present for a grandchild so I can get the package in the mail before we leave in the morning, and Mark made one last trip to town to buy a few provisions that used up all of our Malaysian money except what we will need to send the package tomorrow morning. I am currently canning spaghetti sauce and we have downloaded the last of websites we want to read about going around South Africa. So we are feeling pretty good about being ready to go. We talked to Justin, Jo, and Ziggy earlier today which was their Saturday night, and we have just finished talking with Heather, Jed, Sam, and Jonah on their Sunday morning. Ziggy was the squealer as always, but it was time for bed and he was tired, so we got only a limited number of squeals and smiles before he was done with looking at the computer screen. When we talked to Heather, Jed, Sam, and Jonah it was their morning and it was time for Jonah’s nap. So, after a few delightful smiles at the camera, we mostly saw him sleeping. But Sam, on the other hand, was non-stop entertainment. He is old enough to know who we are so he kicked into high gear. He sang for us, played the violin, and took me sailing on his little wooden sailboat. Unfortunately Mark didn’t get to go along. It was just Sam the elephant and Oma the reindeer on Windbird. We just love to see the grandbabies doing whatever they are doing. This morning, Jean Pierre of Safina came over and spent a good deal of time with us discussing our AGM battery purchase in Singapore this time last year. He needs new batteries and thought the price he was given here was out of the ballpark, but actually it is almost the same as we paid in Singapore. In fact, there is only one distributor for Trojan AGM’s in this part of the world and that distributor is in Singapore. He was ready to turn around and sail south to get a better price, but I think we convinced him that he will not do better than the price quoted here. After he left, we had a flurry of visitors. The first was a group young sailors on small club racing boats. They were being given instructions right next to Windbird and then off they went. Next, Darrell and Loretta of CanKata came over to get a copy of The King and I video from us. And then a couple who had emailed our website last year as they were preparing to set sail from Australia dropped by. Peter and Dell of Pacific Express had read all of our Indonesian logs and just wanted to thank us for the information. So now we will head north and enjoy a few days of island hopping before checking into Thailand. We hope to have time to read more about the passage to South Africa as we travel. We have made the decision to go that way, but we certainly need to spend a great deal of time sorting through the details of where we should be when in terms of the weather. How low can you go? Just when I thought I had bought all that you can buy in Kuah, I found even more goodies. So that waterline has gone down even lower. We went to town this morning with Ed and Lynne of Constance and they showed us a few stores that we had missed. We found capers, sun-dried tomatoes, bulk yeast, and US canned goods. We also bought cheddar cheese and then with heavily laden packs we walked back to the jetty. It took the rest of the day to get all of the things we have been buying packed away properly. We labeled the cans of food, organized them in cabinets, and recorded the locations in an Excel spreadsheet so we will be able to find things when we need them. By the time we finished, it was time to head to Shirena for Happy Hour with Robert and Tina and Darrell and Loretta on CanKata. Shirena will leave for Thailand tomorrow morning. We will leave on Monday morning and hope to catch up with them at Ko Taratao. This is the closest island north of here in Thailand near the mainland; the island where we met our friends Kevin and Claire when we left here last year. CanKata is here for another week before heading north but we hope to see them during the Christmas holiday in Thailand. After Happy Hour we came back to Windbird to close the hatches and lock up before heading to shore for the last night of Karnival. We met Robert and Tina onshore and had a Laksa (soup) for dinner. We walked across the street to the Asia CafÃ© and had a couple of beers (no alcohol on the Muslim side of the street) while watching and listening to the music and dancing at Karnival. Robert and Tina are just beginning their world travels and we had great fun recounting some of our favorite memories of the South Pacific with them. We are so sorry that we will be parting ways with them when we leave Thailand as we have become close friends. We had planned to go through the Red Sea with them, but as you know, plans have changed. But maybe we will see them in the Caribbean in three or four years. Or maybe we will get back to the US and head across the Atlantic to the Med and see them sooner. You just never know . . . The waterline just gets lower and lower as we pack all of this food into Windbird. This morning we walked to town and then got a taxi from there to what is called the ‘wet market’ on the outskirts of town. This is a huge building where fresh seafood, chicken, and lamb are sold as well as fruits and vegetables of all kinds. This morning the fresh lamb was a little too fresh for me. The baby was still baa’ing. This is why we don’t eat lamb much to the chagrin of our Australian friends. But we just can’t do it. We stocked up on veggies for the trip north to Thailand and then walked down to the a little Indian store that has the cheapest olive oil in town. A 5 liter container cost only 68 Malaysian ringgits which is about $22 US. Everywhere else the cost is almost double that. We also bought feta cheese and brie there as it is half the cost of the same thing in other stores. We walked back toward town for about half a mile to get to Plaza Langkawi where we knew we could get a taxi for only 8 ringgits back to the jetty where we leave our dinghy. Mark dropped me off to start putting food away and he zipped away in the dinghy to the Langkawi Yacht Club to buy a 24 hour internet pass. He came back and worked for more than an hour, but finally got us connected to the internet using the new wifi booster. The signal is not great and we are off and on, but at least we were successful in using the new device. We then headed back to shore and walked to the shopping complex known as Billion. We walked in and were immediately stunned with the new Christmas decorations and Bing Crosby and Frank Sinatra singing Christmas carols. Most of the people here are Muslim, some Chinese, but the glittering Christmas decorations and music were almost more than we could take. The Muslims certainly do not celebrate Christmas, but they know the hype makes people buy. So I guess anything goes if you can make a sale. I went to the second floor of the mall to check out the factory outlet there, and again I was a little stunned. You can buy Carter’s and Old Navy children’s clothing here for much less than in a US factory outlet. That’s probably because the clothing is manufactured here, but I had never noticed this before. We did our grocery shopping at Billion and had way more than we could walk back to the jetty with, so we took another taxi. Once the 48 rolls of toilet paper, 24 rolls of paper towels, and a huge plastic bin filled with canned goods were loaded in the dinghy, Mark and I got in with our backpacks full of other goodies. We stopped by Safina to tell them that we are not going to make the air show tomorrow. It is expensive, and we decided that it is just not something that we need to be spending money on. We then went over to say hello to Ed and Lynne on Constance to ask them when we could get together to pick their brains on just how much food one needs to take when heading to the Chagos for a couple of months. They have sailed there for two different seasons and have loads of knowledge. They invited us to come back for Happy Hour after we put everything we had bought away. We spent a lovely couple of hours with them learning that we have really not bought as much as we will need. Yikes! I usually over provision, but this coming year is a whole new ballgame-months on end with no place to shop. So they are going to go into to town with us tomorrow morning and show us some of the places they have used for provisioning that we didn’t know about. In order to get some of the things we need, we might have to take a taxi back across the island close to the Rebak ferry terminal. Evidently there was good shopping on that side of the island that we never knew about. So with the extra shopping tomorrow, it looks like we might not make it out of here until Monday. We really can’t wait to get out and hopefully have some time to read about the places we will be sailing to this season. With our sudden change in direction, we really need to do a few days of intense research and we are hoping the trip north to Thailand will provide that time. As we continue to shop and fill up every nook and cranny on Windbird with food and drink, the waterline just gets lower and lower. Mark went with Tina and Robert this morning to get dinghy fuel and to go to the liquor warehouse. Tina and Robert had a rental car until 11:30, but not all of us would fit so I stayed home and got Christmas ornaments for the grandkids packaged and ready to post. Mark returned with two jerry jugs of diesel fuel, a case of wine, and a bottle of Tanqueray gin and Angostura bitters. This is the last resort. When all the beer and wine is gone, we hear that you can mix gin with water with a couple of drops of bitters and that it makes an acceptable drink. So sometime late next summer when you hear that we are drinking gin, you will know it is definitely time for us to make landfall! After Mark returned he worked with the wind generator. He installed it while we were at Rebak, but we haven’t had enough wind to test it. Now we have wind and he was very pleased that all systems seem to working beautifully. Today we were getting 4-10 amps of powers from 15 knots of wind. That’s a better power boost from the wind generator than we have ever had previously, so maybe the new Air Breeze is really an improvement over the old Air-X. After lunch we went to shore and walked a half a mile in one direction to the post office to mail some packages and then walked the mile in the other direction to town. We had a list of things we needed to get, so we trekked from store to store-picked up underwater photos we took last year with a disposable camera but neglected to get processed, bought a check valve for our plumbing system, returned the courtesy flags we bought two weeks ago for the Red Sea route and got our new flags for the South Africa route, bought a copy of the East Africa Cruising Guide, went to the computer shop to get more advice on how to get our new wifi booster up and running, bought bread, got new prescription drugs to replace outdated ones we have been carrying in case of emergency, bought bread, and then went to the supermarket and filled up the cart with as much as we could possibly carry. We got a taxi back to the jetty as we were now two miles away and the bags were impossibly heavy. Once back on Windbird the chore of finding a place to store everything began. I have one storage area where I keep sand toys, an inflatable kiddy pool, and a plastic box of Duplo Legos that we bought when Sam came to visit last year. We won’t be needing those things this year, so I put canned goods in that storage area and will find another place to keep the toys. Once everything was put away, we headed right back out to say hello to Darrell and Loretta on CanKata and then over to Safina for Happy Hour. We had a great time catching up with Jean Pierre and Collette. The last time we saw them was when they came to stay with us at the One 15 Marina in Singapore. They are staying here for one more year and will doing the South Africa route next year, so we shared information on that. We went to shore to have dinner but didn’t stay for the entertainment tonight. The agreement with the mosque next door to the jetty complex is that no entertainment can compete with prayer times. So it is not until after 8:30 prayers that the show can go on. Maybe we’ll have dinner onboard tomorrow night and then go in later for the entertainment. Nine o’clock is not that late, but it is cruiser midnight. We are also considering going to the public day of the air show on Saturday with Jean Pierre and Collette. We may never get out of here! Tomorrow is Friday so most businesses are closed, but the major supermarkets are open. We will try to finish up our grocery shopping and take time to see what else needs to be done before we leave here. If all is on track, we will decide whether or not to stay for the air show, and then check out and be on our way to Thailand on Sunday. Robert and Tina of Shirena should be heading out about the same time, so we can do a bit of buddy boating on the way up. We can’t wait to get to those beautiful Thai islands once again. We did it! Windbird unplugged and motored out of Rebak Marina after seven and a half months. As she emerged from the winding canal that takes you out to open water, she was immediately hit with 20 knots of wind on the nose. We couldn’t sail into that, so we just motored to Kuah. It was starting to feel like we would never get away as the list of things that needed to be done just got longer and longer. I was rushing madly this morning to finish up some work on the website while we still had internet, but we’ll just have to continue the work as we can. It feels really good to be back out here on anchor. When we pulled into the anchorage in Kuah, Loretta of CanKata came out to wave hello. I don’t think we have seen much of Darrell and Loretta since Kroko Atoll in Indonesia. And Shirena is here as well as Ed and Lynne on Constance. Ed and Lynne are new friends that we met at Rebak and they are going on the same route as Windbird this year. They left Rebak a few days ago and their auto pilot failed on the way to Kuah. So they are here for a couple of weeks waiting on a new one to arrive from the US. Being here will give us a chance to get to know them a little better. We lowered the dinghy, picked up Robert and Tina of Shirena, and went to shore for dinner. Because of the air show, we had heard that there were temporary tents set up everywhere with delicious foods from all states in Malaysia. And we didn’t want to miss that. But it was even better than we had anticipated. The air and maritime show is only part of this week’s celebration. The signs call this Karnival and it is like that. 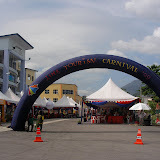 There are balloons, neon stick lights, and cotton candy for the kids, foods of all sorts for everyone, and each night a different part of Malaysia presents the entertainment. Tonight it was Sarawak. Sarawak is on the northern coast of Borneo. The Indonesian state of Kalimantan is to the south, and the Malaysian states of Saba and Sarawak and the independent nation of Brunei are on the northern coast. It was not long ago that the people of Sarawak were forest dwellers, but oil was discovered and they are now a very progressive part of Malaysia. The entertainment was interesting. The music was gamelan as in Bali and the women wore costumes and danced much like the dancers of Bali. But the men wore feathered headdresses and loin clothes like Native Americans. So it was a most interesting and fun evening ashore. We saw David and Patti of This Way Up and Jean Pierre and Collette of Safina tonight. David and Patti are headed out tomorrow for Satun on the mainland to have their boat painted. They have been great friends and we probably won’t see them again unless they make it to the US to do the inland waterway. That is one of Dave’s goals. We will have Happy Hour with Jean Pierre and Collette tomorrow evening and catch up on their adventures. 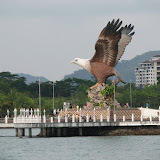 In the meantime, we will shop ’til we drop in Duty Free Langkawi. We are provisioning for eight months and that is a very long time. There will be fresh food along the way, but we understand from those who have done this trek that canned and packaged foods are almost non-existent. And paper products just get more and more expensive. So just how many jars of peanut butter and how many rolls of toilet paper do you think we might need?